After conventional recovery techniques have recovered all the hydrocarbons possible, there may be still a high percentage of the original oil left in the reservoir. This oil can be worth recovering if prices are high. The major methods of improved oil recovery are water flooding and steam injection. "These technologies make a tremendous contribution to recovering additional oil from old wells as well as improve primary recovery of operating oil fields." When applying these techniques, measurement of the flow of water and steam is desirable for control and optimization of the process. Historically orifice plates with differential pressure transmitters have been used for this measurement. 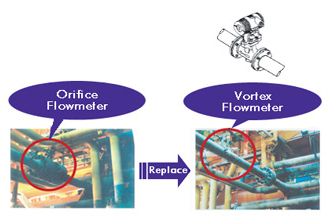 However, vortex flow meters offer a number of features and advantages in these processes and are being applied in greater numbers. It introduces the details of these processes and the effectiveness of the vortex flow meter in the following chapters. Furthermore, digitalYEWFLO is able to address the high temperatures and pressures encountered in these applications. Process temperature ranges from -200 to +450 deg C (-328 to +842 deg F) are available as well as flange ratings to ANSI 2500#. In addition, digitalYEWFLO offers dual sensor designs for redundancy and special control/alarm functions, which is frequently required for safety instrumentation in refineries, as well as self-diagnostic functions for predictive maintenance. These functions are realized on the high reliability of MTBF 400 years. A multi-variable design is also available. 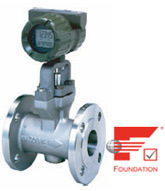 With the multivariable option, a built-in integral temperature sensor allows the meter to make a true mass flow measurement of saturated steam by referring to steam tables embedded in the software. This eliminates the need for separate pressure and temperature sensors and a flow computer. In addition, FOUNDATION fieldbus™ protocol is utilized for device management. Yokogawa's digitalYEWFLO has taken the number 1 market share in the world, and the shipment total has been over 250,000 devices since the launch in 1979. 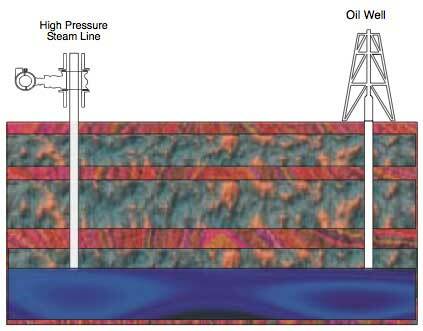 This technology definitely optimizes today's oil/gas recovery at the best efficiency.